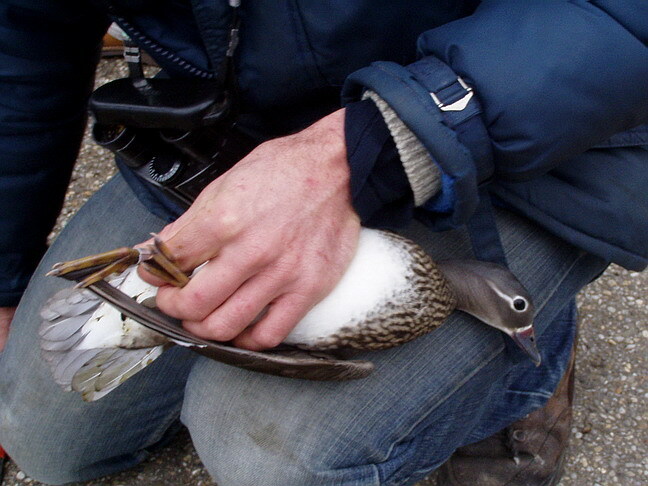 In 1997 in the context of the RAS-project I started ringing Mandarin Ducks in the vicinity of Arnhem. Since December 2010 also colourrings are used. The rings are yellow with black inscription (read upwards). The study area consists of Arnhem, Velp, Roozendaal, Warnsborn and Oosterbeek. 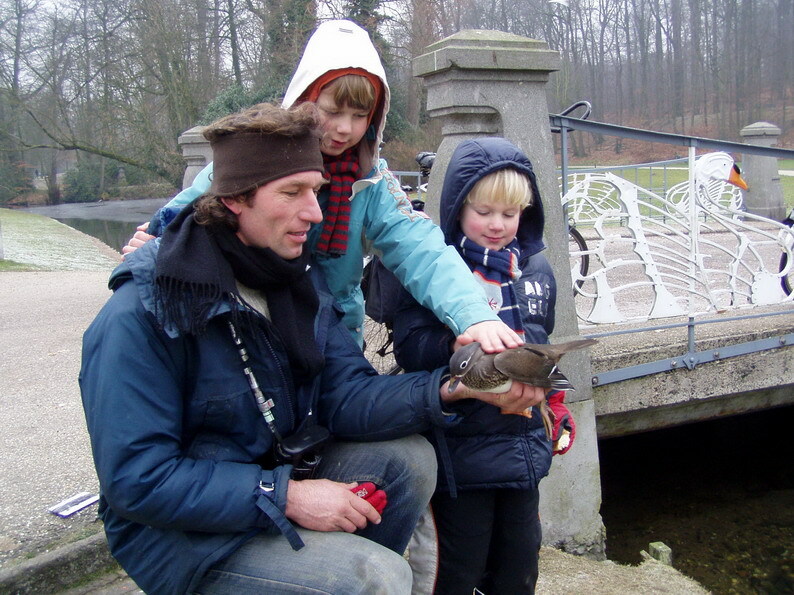 Stef Waasdorp has counted and read the Mandarin ducks intensively in the period 1999 through 2005. In the study area 100 individuals were counted maximally. In the mean time a large part of this population has a ring. The birds are attracted by feeding with bread. Meanwhile the metal rings are being read with a telescope. 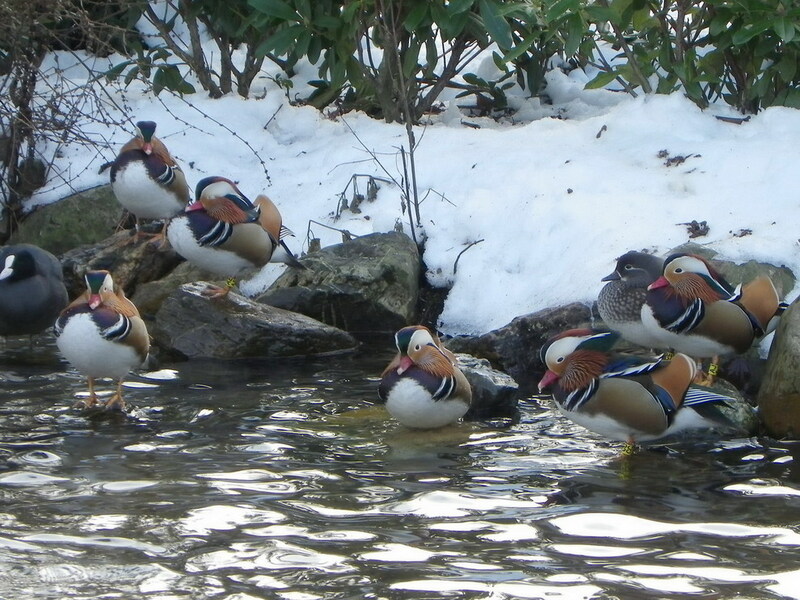 The number of Mandarin Ducks seems to diminish somewhat in recent years. Most likely by a low reproduction, and possibly also due to increases in the number of pine martens in the study area. With severe frost the highest numbers are present in Sonsbeek and in the Vijverlaan in Velp. During the breeding season birds breed in a much larger region, coinciding with the entire Veluwezoom. 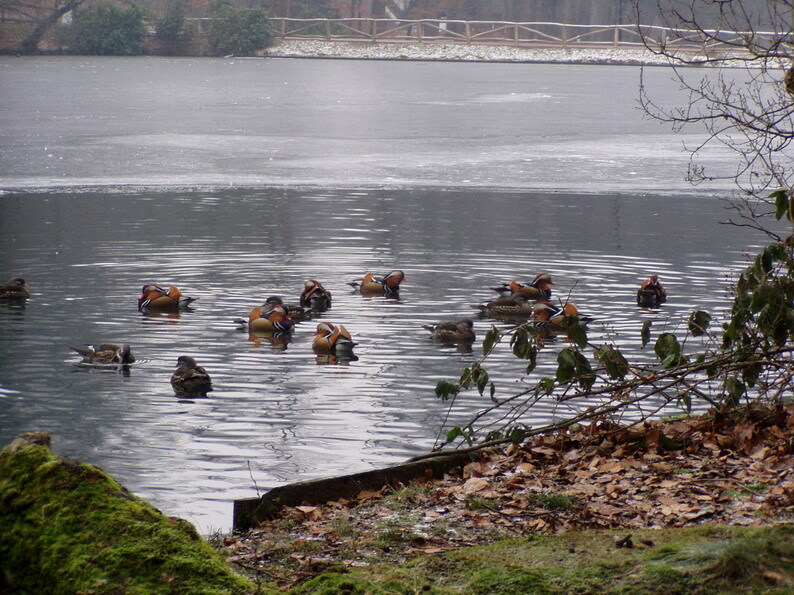 Madarin Ducks with colour rings, Arnhem, 2010. Photos Jeroen Kok. Photos Roy Verhoef, Velp, 2010. 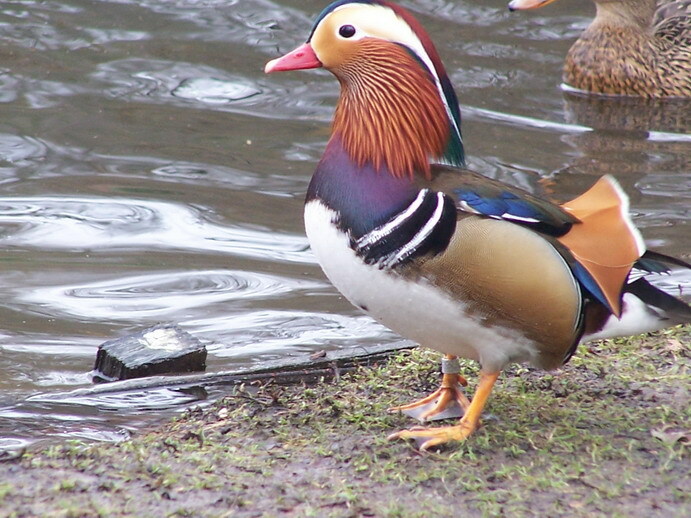 Male Mandarin Duck with ring, Sonsbeek, Arnhem. February 2008. Fitted with a ring as a nestling in Oosterbeek in 2001. © Gerard Herbers. 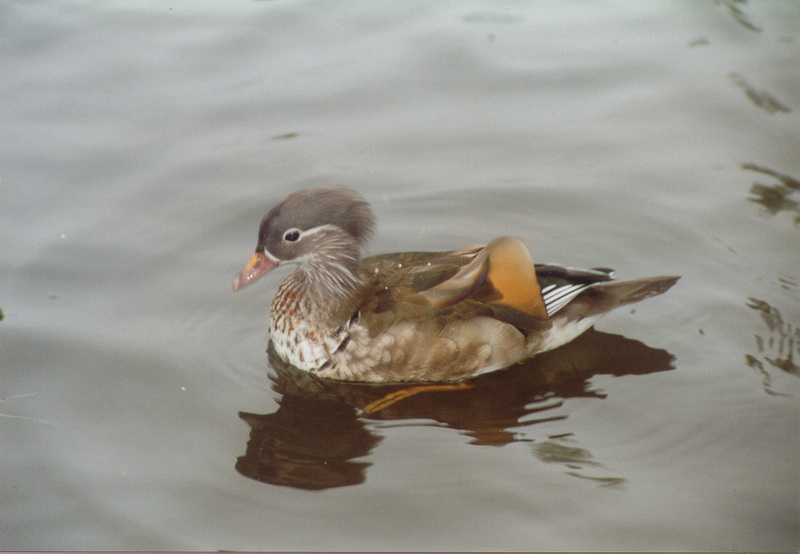 The mandarin Duck is by nature a long distance migrant. Within Europe there are several sightings which cross national borders. 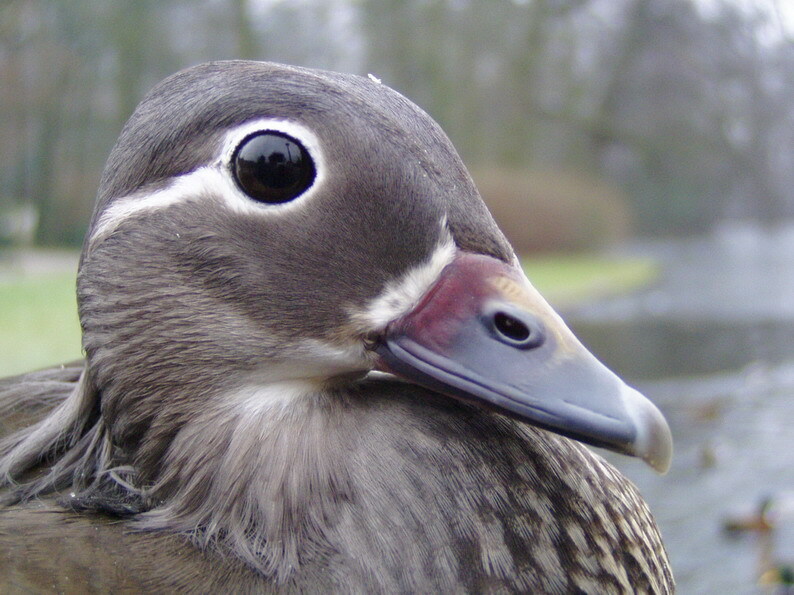 The recovery with the largest distance within Europe is for a Mandarin duck which flew from England to Russia. But the population in Arnhem seems to reside here. During the severe frost Jan 12th 2009 we have visited the population around Apeldoorn for the first time. Next we have seen a total of 66 Mandarin ducks, and seen almost all of the rings, but unfortunately we have not seen any ringed Duck from Arnhem ! But here is a nice surprise ... Male 1st calender year ringed with ring number 5229xxx on Aug 10th 2005 in the town Velp (Gld). Again seen in Arnhem/Velp on Sept 25th 5, Oct 15th 5, Oct 28th 5, March 8th 6 and March 12th 6. Theareafter never heard of again, until it was found dead on Sept 13th 2008 in Svorksjoen, Sor- Trondelag, Norway. Which is 1259 km from the ringing site! I have looked at the original letter at the Vogeltrekstation... The finder reports: "found the ring on a foot of something that looked like a dead duck (?). Feathers and bones found 200m from the shore of Svorksjen (a lake). Probably eaten by some bird of prey". 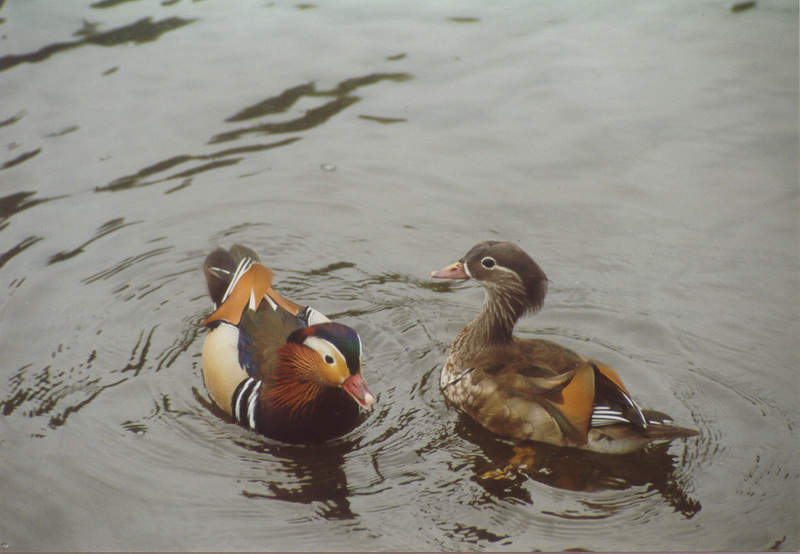 From further questions directed at the finder, it can be concluded that the Mandarin Duck is rare in the environment. 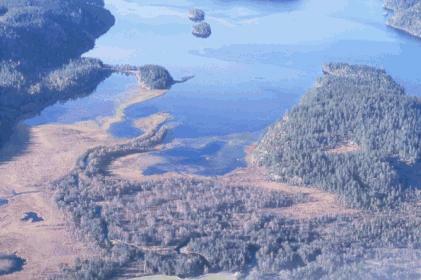 Furthermore he sent a picture of the encironment where the animal was found. In the following Google map is the ringing site and the site of recovery. 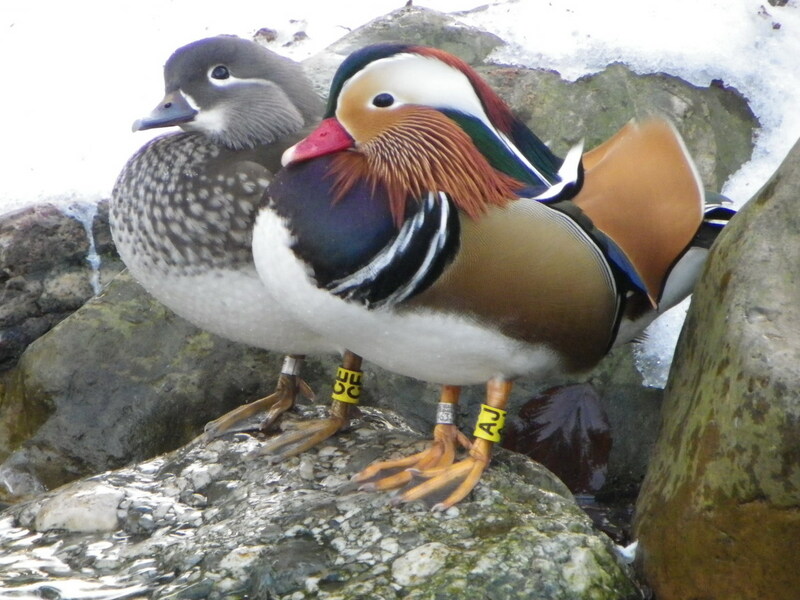 In Germany Mandarin ducks are colour-ringed too. 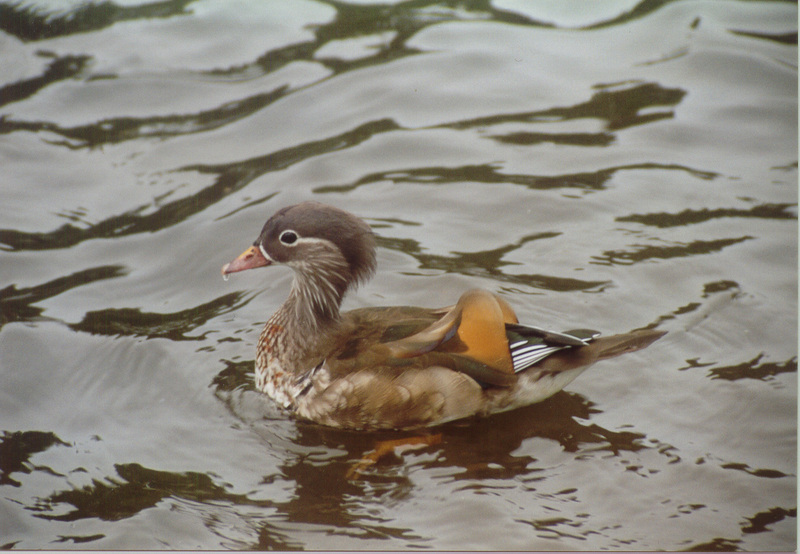 In ducks it is observed more often, older females show plumage which resembles a male. 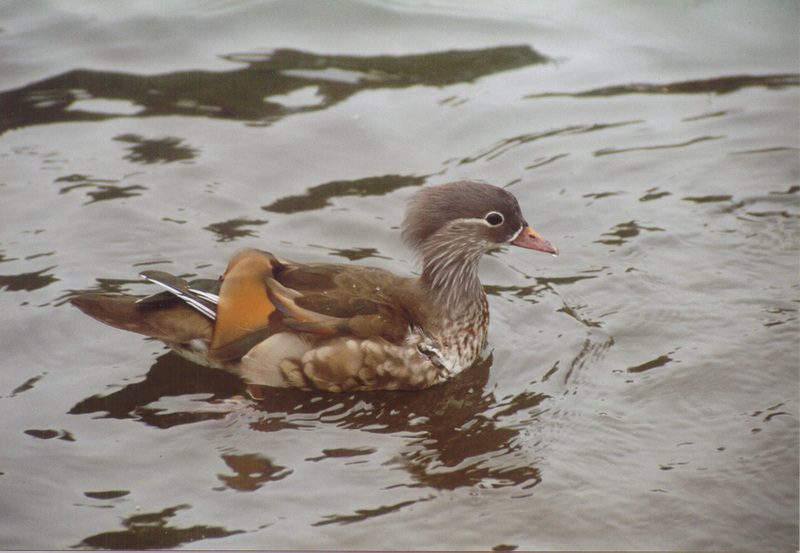 In the last number of years I have observed this twice in mandarin Ducks ! An aging female showed, after complete moult in the after summer, pale orange feathers on the wings and spread out over her body all sorts of male feathers. 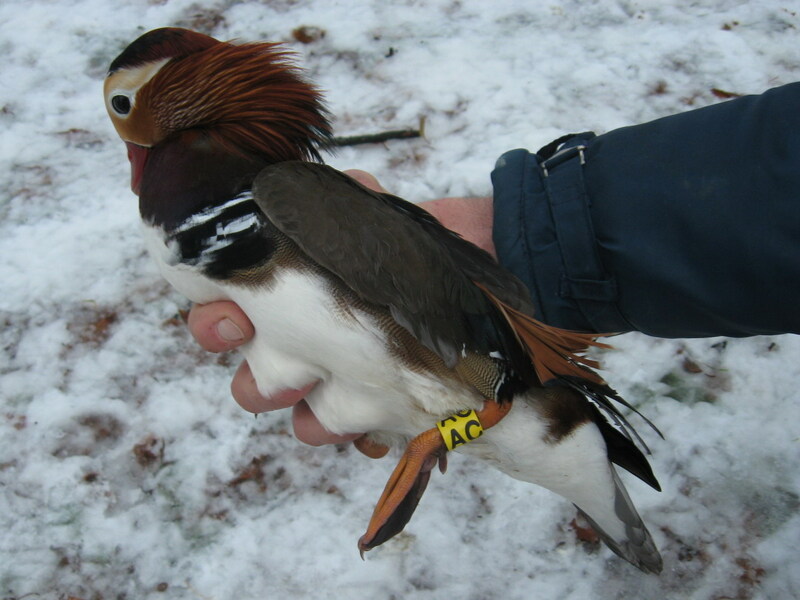 The first (with ring number Arnhem 5142931) ringed on January 7th 1998 as an after first calender year female, in September 2002 after a complete moult, obtained male plumage. Until the last observation on August 20th 2003 this female carried "male plumage". This female was minimally 5 years old when she obtained this "male plumage" for the first time. Below there are several photo's of the female together with her partner, a "real male". Preceding this she was read many times in normal female plumage! The last observation in normal female plumage has been in July 2002. 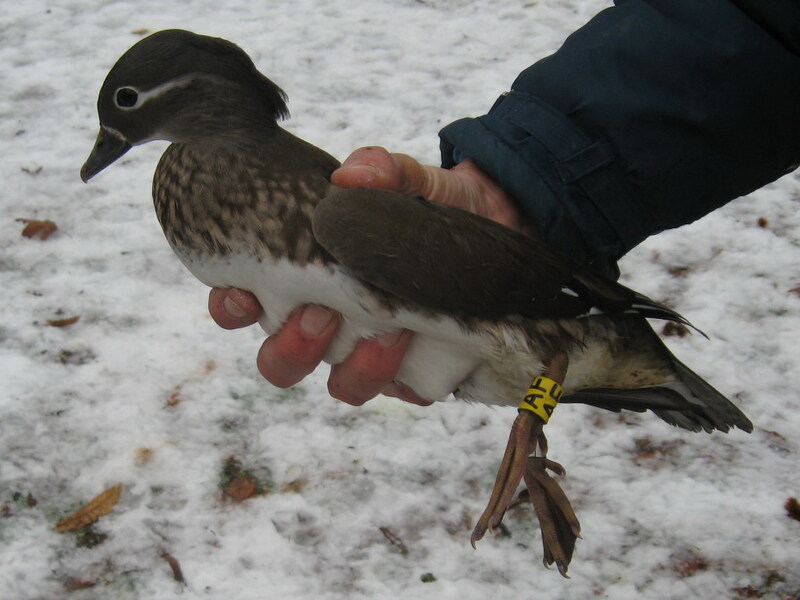 The second (with ring number Arnhem 5137065) ringed as an after second calender year female on July 18th 2001, obtained male plumage in August 2009 after a complete moult for the first time. The plumage was comparable to the bird described above.This female was minally 9 years old at that time. Before these observations she was read many times in normal female plumage! The last observation in normal plumage was in May 2009. Unfortunately I have seen this bird once in "male plumage", and I have not yet been able to make photo's. See here a video impression (in dutch).